37 Offer available to qualified retail customers in Canada on select vehicles delivered to an authorized GM dealer in Canada from April 2 and April 30, 2019. 0.99% purchase financing offered on approved credit by TD Auto Finance Services, Scotiabank® or RBC Royal Bank for 60 months on eligible new 2019 Traverse. Other trims may have higher effective rates. Participating lenders are subject to change. Rates from other lenders will vary. Down payment, trade and/or security deposit may be required. Monthly payment and cost of borrowing will vary depending on amount borrowed and down payment/trade. Example: $37,527 financed at 0.99% nominal rate equals $641 monthly for 60 months. Cost of borrowing is $952 for a total obligation of $38,479. Freight and air conditioning charge ($100, if applicable) included. License, insurance, registration, PPSA, applicable taxes and dealer fees not included. Dealers are free to set individual prices. Limited time offer which may not be combined with certain other offers. General Motors of Canada Company (GM Canada) may modify, extend or terminate offers for any reason, in whole or in part, at any time, without notice. Conditions and limitations apply. See dealer for details. ®Registered trademark of The Bank of Nova Scotia. RBC and Royal Bank are registered trademarks of Royal Bank of Canada. TD Auto Finance is a registered trademark of The Toronto-Dominion Bank. As part of the transaction, dealer may request documentation and contact GM Canada to verify eligibility. These offers may not be redeemed for cash and may not be combined with certain other consumer incentives. Conditions and limitations apply. Void where prohibited. See Dealer for full program details. The Traverse is full of technology and innovation while keeping your safety top of mind. The combination of Traverse’s bold new design and functional features will appeal to all drivers. This roomy mid-size SUV offers maximum cargo space with seating up to 8. 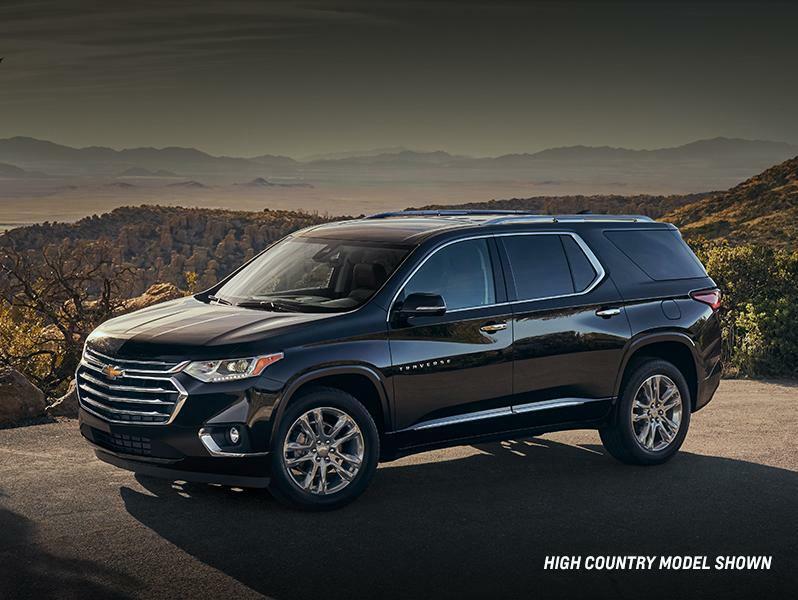 The 2019 Traverse offers a comfortable ride for up to 8 passengers with thoughtful details including available leather appointments and premium stitching. The enhanced Smart Slide® second-row seat on the passenger side can be moved and angled forward, allowing passengers easy access to the third-row seats. The 2019 Traverse has advanced safety technologies, using available cameras, ultrasonic sensors and radar to detect potential hazards to help you avoid collisions before they happen. While parking or traveling at low speeds, available Surround Vision technology uses strategically placed cameras to create a virtual bird’s-eye view of the vehicle.